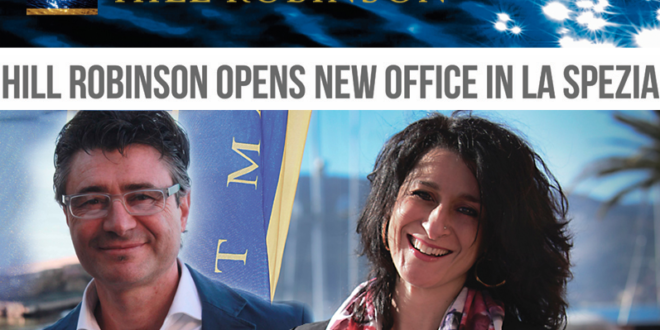 Our new office in La Spezia, is opening up access to the Hill Robinson global project management skillbase in Italy and we are looking forward to working alongside some of the most illustrious names in Italian yachting. The Porto Lotti Marina office is on the doorstep of the Baglietto, Sanlorenzo, Fincantieri, Ferretti and Perini yards in La Spezia, it is also close to many other major Italian yards. The new office has already been put to good use – with a technical training day seminar, with talks from Marine Nano Tech, Rolls Royce on hybrid and electric propulsion and the Atlas Group. Further presentations in the afternoon on IT technology by Pibiesse and medical assistance by Yacht Medical Supplies were rounded up by a talk on cyber security by Lloyds Register. The event was well attended by around 30 captains, crew and industry people. Our experienced Senior Project Manager Pino di Mora will be pleased to support owners, captains and crew in his native Italy. The office will be offering all our technical services, compliance, yacht management and project management for new build and refit projects. Rosanna Capitani our business development specialist in Italy will be promoting other services, specifically crew placement, payroll management, charter and much more. Porto Lotti itself, one of the Italy’s most exclusive marinas, with its own repair facility and highly qualified staff, is located in the centre of a very sheltered gulf next to the beautiful Lerici, and has been awarded the international Blue Flag label in recognition of its status as an outstanding marina. It is also immediately adjacent to the Cinque Terre National Park, a UNESCO World Heritage Site which includes Porto Venere and the islands of Palmaria, Tino and Tinetto, an area of breathtaking views, secluded beaches and beautiful anchorages. Contact lovethesea@hillrobinson.com to find out more.